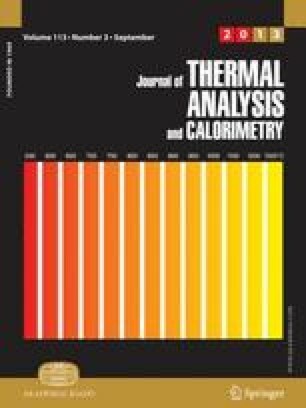 Kinetics of dehydration of equilibrium swollen poly(acrylic acid) hydrogel was investigated using methods of non-isothermal thermal analysis. Methods of Kissinger, Coats-Redfern, Van Krevelen and Horowitz-Metzger were applied for determination the kinetics parameters: activation energy (E), pre-exponent (lnA) as well as the kinetics model ƒ(69) for the process of hydrogel dehydration under different heating rates. An existence of good agreement between determined values of kinetic parameters (Eand A), which were obtained applying different methods under the same heating rate. Functional relationship between changes of kinetic parameters of dehydration and changes of heating rate was established. An existence of compensation effect is accepted and explanation of compensation effect appearance during the hydrogel dehydration is suggested.